Featuring American vintage style patterns and designs, the lineup includes pieces in Japanese sizes and silhouettes with the materials and details that have been enhanced with modern casual styles for today’s tast. 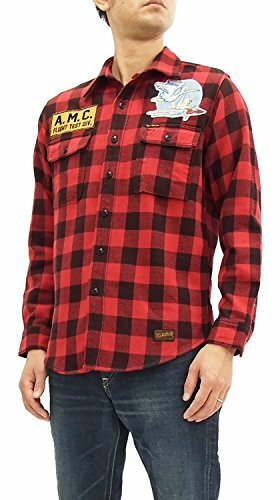 Here is one piece from the TOYS McCOY brand : a long sleeved twill check plaid work shirt for men. (working man style shirt). This full button-front shirt has a regular collar with collar stand for crisper appearance, and a curved hemline for a round bottom. Buttons are 2-holes urea buttons with engraved diamond shape design. The left side chest one is a sweat proof pocket with squared lower corners. This unique pocket design features a front and back sided pouch sewn on the shirt body as opposed to a conventional patch pocket sewn directly on the shirt body. This pocket is constructed to create the pouch for preventing the contents of the pocket from contacting the shirt body directly, hence the lack of stitching on the pocket’s bottom. Then, the left pocket has a pencil slot and brand label. The sleeve openings are finished with one button cuff with sleeve placket. Key areas are double-stitching and rolled seams for superior strength. This graphic is inspired and designed by Charles Elwood “Chuck” Yeager. Charles Elwood “Chuck” Yeager is a former United States Air Force general officer and record-setting test pilot. In 1947, he became the first pilot confirmed to have exceeded the speed of sound in level flight.